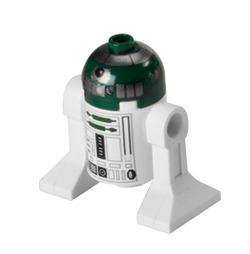 R4-P44 is a Star Wars minifigure released in 2010. It has a green and silver dome, with a green and white body. In one of the preliminary pictures of the set, he is mistakenly referred to as R4-P17; however, this is not the final (or correct) name, as R4-P17 was Obi-Wan Kenobi's astromech droid, and featured a red dome. This page was last edited on 11 March 2016, at 22:41.